The simpleRTK2B – Starter Kit LR (Long Range) allows simple and fast evaluation of Dual Band GNSS (GPS/Galileo/Glonass/Beidou) RTK technology, based on u-blox ZED-F9P module. RTK technology introduces the concept of a “Rover” and a “Base Station”. By using a data stream from the base station, the rover can output its relative position with cm‑level accuracy in clear sky environments. One of the known problems of Single Band RTK is its convergence time of more than 60 seconds. Dual Band technology reduces this time below 10 seconds, increasing substantially the availability of cm-level accuracy. RTK technology works when base and rover are within 20km from each other. If you want to challenge this limit, this is your recommended Starter Kit. 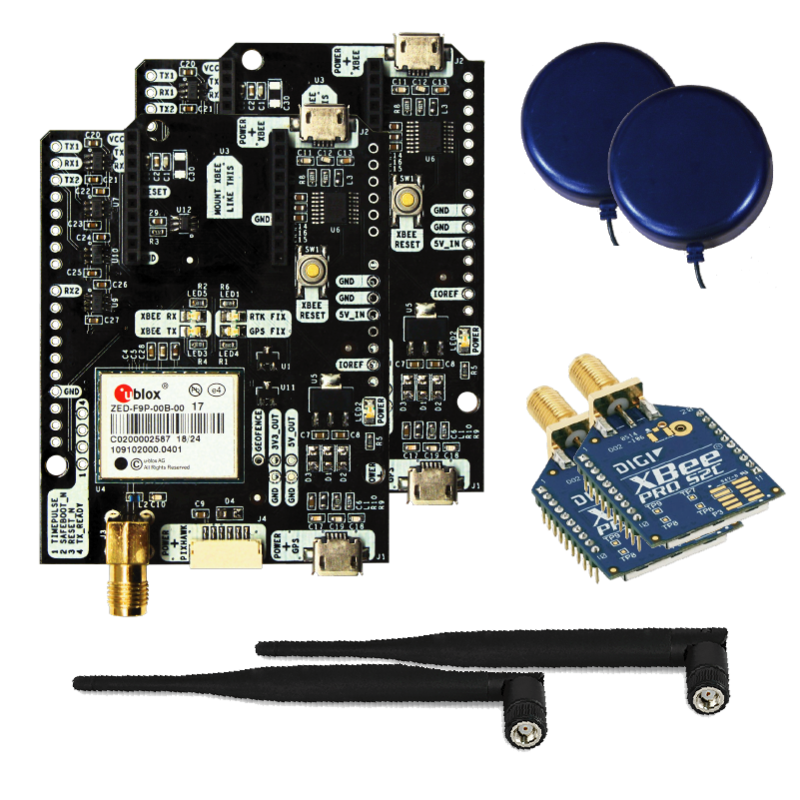 The kit includes 2 boards with base and a rover functionality, and radio modules that will let you send RTK corrections up to 10km. If that’s too much and you are looking for a more affordable solution, check out our Starter Kit MR. Check out simpleRTK2B page to learn more. Don’t forget to add in the shopping cart our Configuration Service if you want to receive your kit pre-configured. – You can have multiple rovers by using additional simpleRTK2B boards together with your kit. – This product is recommended if you want to evaluate u-blox ZED-F9P. – The included radio modules will let you send RTK corrections up to 10km. This distance will depend on the region of use, subject to local regulations. We will adjust the radio setting according to your shipping address. If that’s too much and you are looking for a more affordable solution, check out our Starter Kit MR.